The most important thing to know when buying a flat panel or TV cart is the size of the monitor you're placing on it. The size that is often referenced is the diagonal screen size. If you don't know the size of your monitor, measure it diagonally from the top left corner to the bottom right corner of your screen. We list the maximum screen size for flat panel carts in the specifications section of each product page. Safety is the main concern here. Generally speaking, the larger the monitor, the lower you want to keep the center of gravity, so a shorter cart is better. Of course, you'll also have to have your monitor high enough for your audience to see. If your audience is adults in chairs, you'll want the monitor higher than if it's first-graders on the floor. Also, the larger the room, the higher you'll usually want the monitor. Some carts have adjustable heights while others have fixed heights. Most flat panel and TV carts are made of either steel or plastic. Plastic carts won't rust, don't show many scratches and are typically quite affordable. 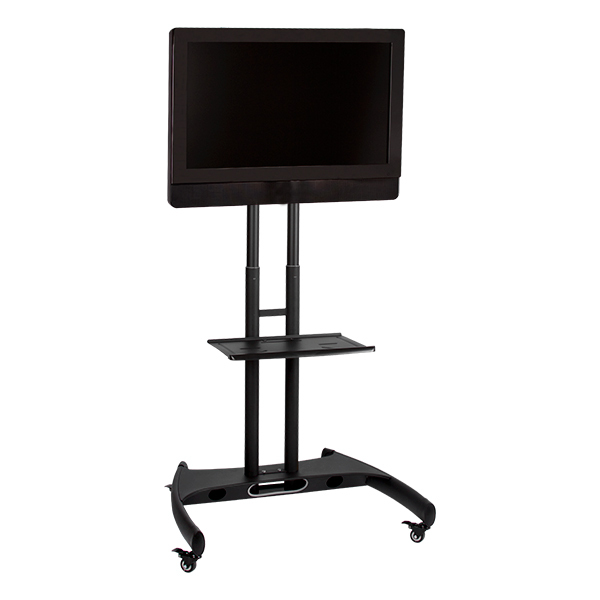 While most plastic flat panel carts have metal reinforcements, you'll still want to go with a steel cart for large or heavy monitors. Steel carts are strong enough to hold some of the heaviest monitors. Be sure to check the gauge of the steel, and keep in mind that the lower the gauge, the stronger the steel. 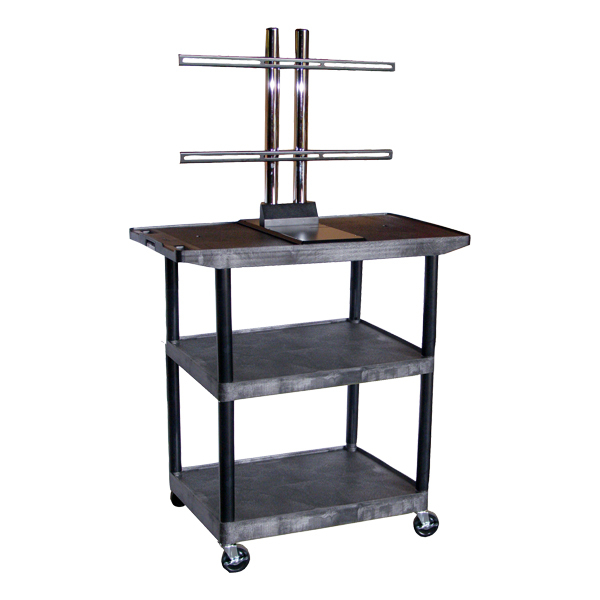 Most flat panel and TV carts come with four-inch or five-inch casters, with at least two locking brakes. Some carts feature dual-wheel casters or swiveling casters that offer a smoother ride and easy mobility. Be sure to consider the materials and equipment you'll be storing on the cart. It's important to make certain all your valuable equipment is supported and stays secure. Shelves - You'll want to make sure you have enough shelves – and sufficient distance between the shelves – to accommodate all of your audio and classroom supplies. Models with adjustable shelves give you room to store larger, bulkier items, and extendable side shelves let you keep laptops and papers within reach. Security cabinets - Some models feature lockable security cabinets, so you can keep your laptops and AV equipment safe. They will either have sturdy steel doors or glass doors, which are usually tinted to protect valuable equipment. 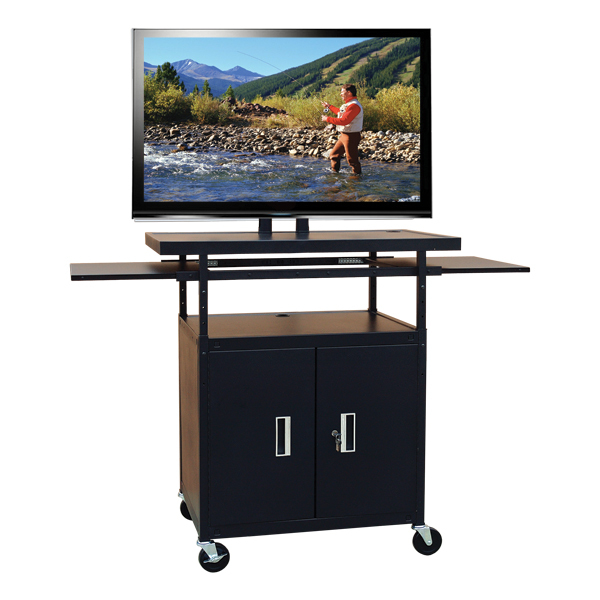 Some flat panel and TV carts include accessories such as built-in power strips and cord winders for convenience and safety straps to keep your equipment from sliding. You can also add a speaker bar, laptop shelf or keyboard shelf to your flat panel or TV cart for an additional charge. Be certain to make sure you're getting everything you need. 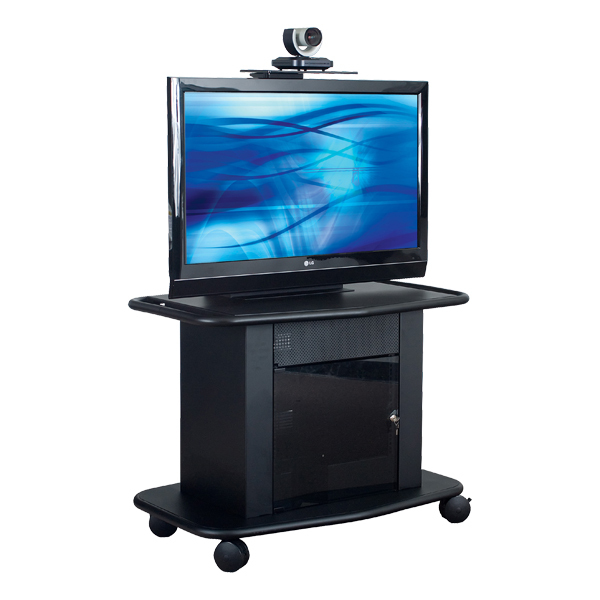 Check out all of our Flat Panel & TV Carts to find the cart that best fits your needs. If you find that you have questions, or just prefer ordering by phone, give us a call at 1-800-260-2776. Our trained sales team is happy to assist you.